In one of my EDC photos last week, I showed that I carry a 40oz Klean Kanteen. I think the water tastes better from the stainless steel bottle than from a plastic Nalgene, and prefer carrying 40 ounces over just 32. The main complaint many people express concerning a single-walled stainless steel bottle is that you can’t carry hot liquids in it. That’s not much of a detraction for me, since I have a different bottle for that. 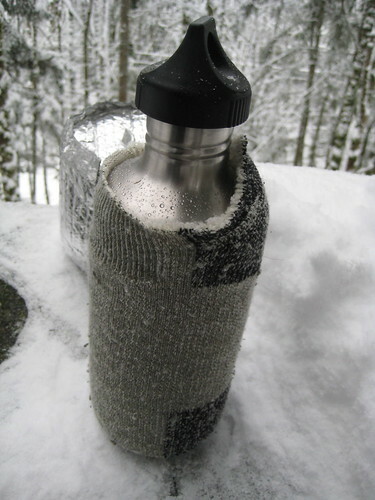 What does annoy me is that, in the cold, when the bottle is filled with cold water, the stainless steel can become too cold to touch without gloves. To address this, I took an old wool sock and cut it off at about the neck of the bottle. Instant insulation. The only disadvantage is that the sock is just a little too thick for the bottle to nest inside my mug. Depending on how you carry the bottle, you might want to cut off a few inches from the bottom of the sock as well as the top. This post was published on 2008-12-18 . It was modified on 2012-09-15 . It was tagged with water, gear.